These days Cologne has one of the most intriguing architectural landscapes in Germany. The east bank of the Rhine now sports the Rheinboulevard, an expansive and attractive riverside space with generous stone steps that stretch 500 metres along the waterside between Hohenzollernbrücke and Deutzer Brücke and are a popular meeting place for Cologne residents and visitors alike. Rheinauhafen, Cologne’s historic harbour district on the opposite bank of the Rhine, is a promenade with an international feel that showcases the modern side of what is Germany’s oldest metropolis and has quickly become the home of the city’s creative scene. At its centre are the three spectacular Kranhäuser, or “crane houses”, a design by Hamburg-based architects Bothe, Richter, Teherani. The traditional and the modern maintain an easy relationship in Rheinauhafen. For instance, the district’s former granary, often referred to as Siebengebirge (seven hills) owing to its distinctive steep gables, has been carefully restored and is now an attractive residential and office building. Yet another architectural highlight, the Weltstadthaus, arrived in Cologne’s best known shopping precinct Schildergasse in 2005. 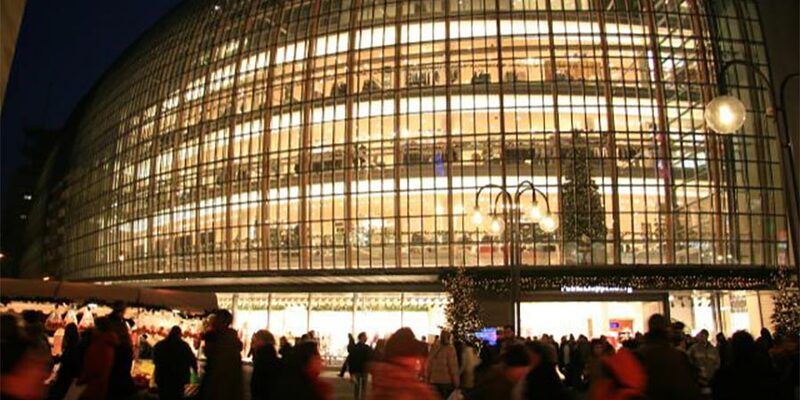 Designed by renowned architect Renzo Piano, this extravagant glass-fronted palace houses the Cologne branch of Peek&Cloppenburg, a fashion retailer. Its shape is reminiscent of a stranded whale and so it’s no surprise that Colonians immediately dubbed it “Walfisch”. Nearby is the architectural treasure that is Kolumba, the Archdiocese of Cologne’s art museum, which moved into its spectacular new home, designed by Swiss star architect Peter Zumthor, in September 2007. The building encases the ruins of the ancient Roman church of St Kolumba, which was badly hit by bombs in 1945. Liebe Deine Stadt (love your city) is an extraordinary campaign designed to strengthen Cologne residents’ interest in and ability to identify with their city’s post- war modernist architecture. In 2005 concept artist Merlin Bauer began to raise public awareness of Cologne’s prominent buildings of the 1950s and 60s. The campaign’s oversized red lettering features prominently atop the building straddling the city’s busy north-to-south dual carriageway near Offenbachplatz, where the opera and theatre complex designed by the late Cologne architect Wilhelm Riphan is currently being prepared for reopening. To further support public awareness for architecture and its relevance for the city, the Kölner Architekturpreis kap (Cologne prize for architecture) honors architecture treasures throughout the city – including average, yet meaningful buildings as much as world class constructions. 250 special buildings in the city have received the prize to date. The award counts to Germany’s oldest and most significant architecture prizes. given an extensive facelift. A new cultural centre in close proximity to the cathedral is under development – it will have an architecturally intriguing exterior spanning the City Museum, parts of the Romano- Germanic Musem and the premises of the Curia. It will also include what is known as Via Culturalis, an 800-metre “culture path” extending from the cathedral through the Old Town to the Roman church of St. Maria im Kapitol, along which the layers and traces of two thousand years of urban and cultural history will be made visible. It will also lead past the Archaeological Zone with the Jewish museum MiQua, which is slated to open in 2021.